1015 Lg General Purpose Roof Drain w/ Adjustable Extension - Jay R. Smith MFG Co. 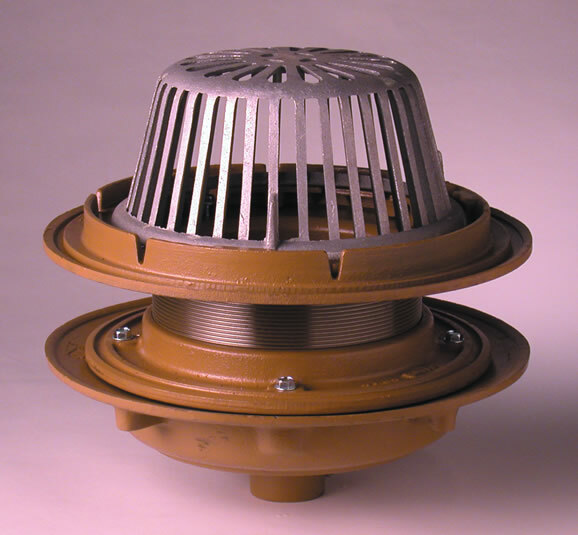 Figure 1015 is a large general purpose roof drain with a side outlet. Every bit of savings counts on a big job. When you choose an adjustable roof drain you eliminate the need to order multiple extensions in varying heights. Contractors appreciate the fact that this roof drain can accommodate the inevitable inconsistencies in roof insulation thickness. Simply spin the adjustable extension to fit insulation from 1-1/4 to 4 inches (32 to 102 mm) thickness. Used in flat roofs of any construction. The adjustable extension sleeve permits adjustment from a minimum of 1-1/4 inch (32 mm) to a maximum of 4 inches (102 mm), easily accommodating up to 2-3/4 inch (70 mm) of varying insulation thicknesses. The positive threading allows smooth perimeter movement and circumferential support of the top at any adjusted elevation. Large low profile dome provides sufficient free area for quick drainage of rainwater and protection against debris. Large, low profile dome for quick drainage and production against debris. Duco Cast Iron Body with Adjustable Extension Sleeve, Reversible Collar, Combined Flashing Clamp and Gravel Stop, with Polyethylene Dome.